REPINO, Russia (AP) — Forget bending them like Beckham. At this World Cup, it has been a case of teasing them in like Trippier and angling them in like Ashley. Set pieces have been the main source of goals at the tournament in Russia — 42 percent, no less — and England has been the master of that department on its run to the semifinals. Eight of its 11 goals so far have come via free kicks, corners or penalties, which is four more than any other team and the most since Portugal also scored eight set-piece goals at the World Cup in 1966. This hasn’t come about by fluke. Meticulous preparation — including a trip to the United States to take in an NBA game — the selection of specific players with strong dead-ball delivery, and the defensive nature of high-pressure tournament football has led to a point where set pieces could yet lead England to a second World Cup title. “Set pieces have been a massive thing for us and other teams through the whole of the World Cup,” Ashley Young, one of England’s set-piece takers, said Monday. “Obviously we work on them in attack and defense, and they are vitally important for us. A decade ago, England had one of the best set-piece takers in football in David Beckham, whose precision and ability to curl the ball in from the wing was an important weapon at major tournaments. So famous were his crosses that a movie, “Bend It Like Beckham,” was spun off it in 2002. In England’s class of 2018, free kicks, corners and wide crosses are mostly provided by England’s wing backs, Young and Kieran Trippier, and they are proving tough to defend. Young set up England’s first goal in the 2-0 quarterfinal win over Sweden with a driven corner from the left wing that was headed in by Harry Maguire. Trippier’s delivery from the right has been even more impressive, so much so that some have nicknamed him the “Bury Beckham” — a reference to the northern town where he was born. Only a few months ago, Young and Trippier were far from sure of getting into England’s World Cup squad, never mind the starting team. However, Gareth Southgate, the team’s forward-thinking coach, decided to switch formation to a 3-5-2 last year in an effort to give more security to his defense, enable his midfielders to have more possession, and to get more support for star striker Harry Kane. Another side-effect was the necessity for wing backs, and who better than the energetic Young and Trippier? But it’s more than just England’s crossing ability. It’s what the players are doing when the ball goes into the area. Southgate spent time in the United States at the start of the year, watching the Super Bowl but also NBA games in a bid to discover how teams got themselves into space near the basket via choreographed moves and plays. Southgate also recruited Allan Russell, the team’s attack coach, who has keenly studied set-play moves in American Football and the NBA. At the World Cup, England’s players have acted as screens to block defenders and give teammates space to attack the ball, as seen in England’s opening goal against Panama scored by center back John Stones. They’ve used decoy runners. They’ve lined up in bizarre formations to confuse their markers — like against Colombia in the round of 16 where four players stood in a row before splintering off. It helps having big, tall players like Maguire and Stones to get on the end of the crosses. “They are willing to put their heads through a brick wall,” Young said with smile. Three of England’s goals have come from the penalty spot, all converted by Kane, and the team won a penalty shootout for the first time at a World Cup to beat Colombia. Southgate has worked on improving England players’ psychology going into shootouts, while goalkeeper Jordan Pickford used information — detailing where Colombia’s penalties were likely to go — that was written on a water bottle next to his goal. 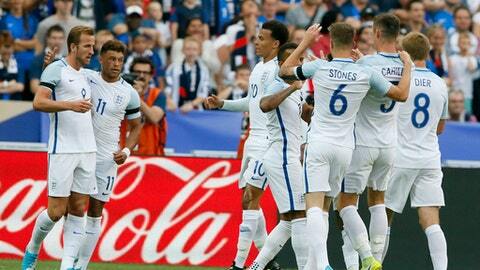 Meanwhile, five of England’s goals have been headers, also tying the record for a single World Cup since 1966. It was telling that against Sweden, when both goals were from headers, England’s players picked their moments to cross in the ball. Kyle Walker, for example, repeatedly found himself in good areas and space to deliver a cross but chose to lay the ball off to players with better delivery like Trippier and Jesse Lingard, who assisted Dele Alli for the second goal. Croatia has scored two set-piece goals at the World Cup — one being a penalty — so the English appear to have the advantage in this department. Expect them to exploit it in Moscow on Wednesday.